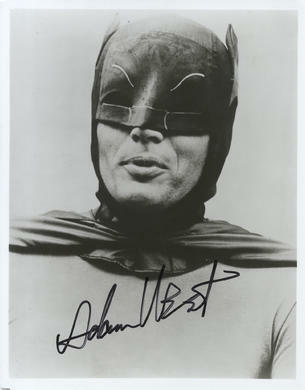 This is a Hand Signed Black and White 10" x 8" Photo of the late American Actor in the role of Batman. Adam West (born William West Anderson; September 19, 1928 – June 9, 2017) was an American actor widely known for his role as Batman in the 1960s ABC series of the same name and its 1966 theatrical feature film. His career spanned 63 years. West began acting in films in the 1950s. He played opposite Chuck Connors in Geronimo (1962) and The Three Stooges in The Outlaws Is Coming (1965). He also appeared in the science fiction film Robinson Crusoe on Mars (1964), and performed voice work on The Fairly OddParents (2001), The Simpsons (1992, 2002), and Family Guy (2000-2017), playing fictional versions of himself in all three.